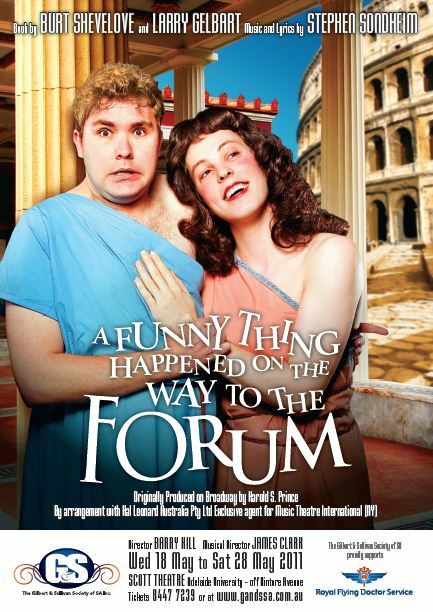 The Gilbert and Sullivan Society of South Australia take to the stage with Stephen Sondheim’s A Funny Thing Happened on the Way to the Forum at the Scott Theatre from 19 May 2011. Featuring music and lyrics by Stephen Sondheim and book by Burt Shevelove and Larry Gelbart, this beloved musical gets the full Broadway treatment, under the careful direction of Barry Hill and musical director James Clark. The creative team is rounded out by choreographer Kerry Hauber and set designer Christopher Anderson. A comedy that embraces all things farce and vaudeville, Forum is the story of the slave Pseudolus and his desperate attempt to win his freedom by helping his young master woo the virginal courtesan next door. Forum brings together a cross-section of Adelaide talent. James Nicholson (Hero) and Natalie Tate (Philia) are currently training at the Elder Conservatorium, while the cast also includes established performers like Nicholas Bishop (Pseudolus). And then there is G&S icon director Barry Hill. “The Society is my home and I am happy to be back and working on such an exciting and different show for the Society,” says Hill, who has served the Society as Committee Member, Secretary, Vice President, Choreographer, Director and Performer. The use of artists who have a broad spectrum of experience is in keeping with the Society’s intention to produce high quality theatre whilst giving new talent the opportunity to learn from Adelaide’s best and established artists.